Take a sneak peek behind the scenes of our latest photoshoot. With new products to shoot and old favourites in need of a Spring makeover, we chose a stunning barn in Wiltshire to be our home for the day. The location provided a bright, stylish space with huge windows and a clever wall that could be changed from rustic wood to elegant panelling in a matter of minutes. With a fantastic team including interiors photographer Marc Wilson, The Lounge Co. crew and the heavy-lifters from Grays Transport, we started the day (after coffee and a croissant of course) by shooting the new Paloma Chaise End against the wooden panelling. We’d painted it grey as we felt it would create a softer look; more calming and laid-back. The grey worked beautifully with the tonal blues of the Paloma sofas. The Chaise, a new addition to the popular Paloma range, was upholstered in Vintage Velvet - Antique Ink, the 3 Seater Sofa in Washed Cotton - Nordic Dusk. Love the look? We used Dove Grey Matt Emulsion by Home of Colour at Homebase. You’ll find similar colours in other DIY stores; just look for a pale grey with blue undertones. Alternatives we've found are Warm Pewter by Dulux and Farrow & Ball’s Manor House Gray. As well as shooting some brand new products, we gave a couple of our existing styles a fresh look for the new season. 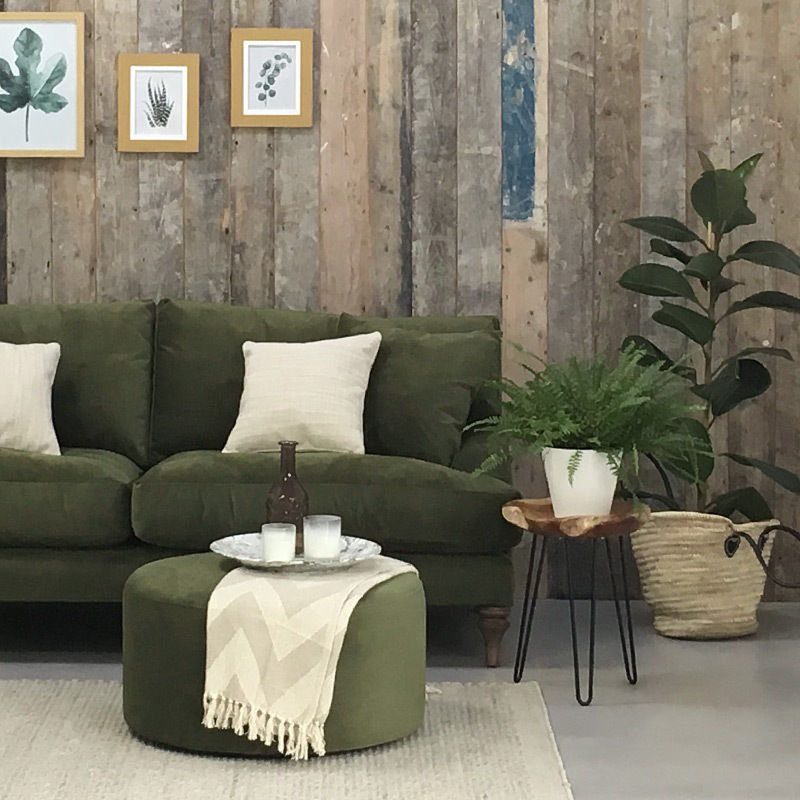 We chose our favourites from the emerging SS18 trends and gave them The Lounge Co. twist; making them relevant, and easy to reproduce in your own home. The Scandinavian look has been a firm favourite for several seasons now. Think pared back interiors, a palette of white, grey and taupe and furniture and accessories with clean lines. Spring 2018 has seen this trend get a splash of colour! The addition of lemon yellow to the understated, monochromatic colour scheme is akin to a beautiful ray of sunshine coming through the window. We’ve used this vibrant, zesty shade in the form of cushions, a floor lamp and fresh, seasonal flowers. Green is always a go-to colour if you’re giving your lounge a Spring transformation. We decided to clad Rose, an old favourite, in our new Woodland Moss velvet. Finish with cushions and throws in neutral tones and an array of botanical prints in wooden frames. We found these gorgeous plant prints at Scandi-inspired homeware store Skandis. 1 day, 6 hard-working people, 5 sofas, 4 chairs, 3 footstools, 20 cushions, 4 large pizzas and a lot of coffee made our Spring photoshoot a great success.